What would TV viewers think if the lottery lady announced that the numbers drawn from a bucket with 49 balls were 1, 2, 3, 4, 5, and 6? Since the probability of getting all six numbers right is about 1:14 million and there are 44 combinations of consecutive lottery number combinations (1, 2, 3, 4, 5, 6 through 44, 45, 46, 47, 48, 49), the chance of a straight in the lottery is about 1:318,000 – this means that the incredible event would occur relatively quickly with a fast draw generator. Listing 4 shows an automatic drawing machine in the lotto_draw() function. From 49 numbered balls in the numbers list, it draws six random numbers and then removes them to prevent double draws. Since it takes a significant amount of compute time to remove an element from a Python list and move up the remaining elements to close the gap, the function swaps the value of the selected element with the last element in the list and reduces the list length size by one – much faster! 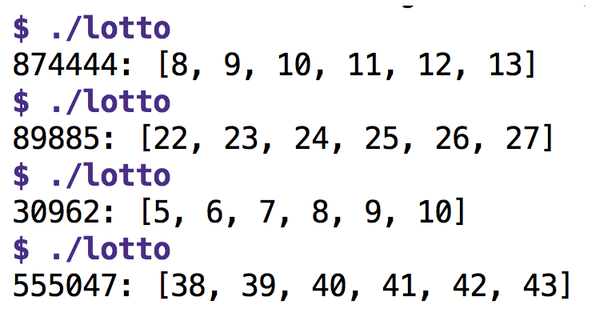 Following this algorithm, lotto_draw() returns a sorted list of six randomly selected balls. The main program starting in line 30 uses is_consecutive() to check whether the drawn numbers each differ only by one from their predecessor. If this is the case, line 35 prints the number of draws in count and the lucky numbers that led to the termination. Figure 3 shows that this sometimes occurs after 30,000 passes; sometimes, however, it takes more than 800,000 – purely random, but within the calculated probability. Figure 3: The lottery generator determines the number of draws until it finds a curious outcome. Python Tricks  by Dan Bader is recommended for implementing this and other cool Python tricks. It shows a multitude of everyday programming tasks with elegant Python solutions. It is perfectly suited for users of other programming languages (like Perl!) who are mainly interested in converting typical idioms into clean Python and don't want to start with Adam and Eve and "Hello World." Mike Schilli works as a software engineer in the San Francisco Bay area, California. Each month in his column, which has been running since 1997, he researches practical applications of various programming languages. If you email him at mailto:mschilli@perlmeister.com he will gladly answer any questions. A competition to design the new 5 euro commemorative coin, set by the Dutch Ministry of Finance, has been won by Stani Michiels, the Belgian artist and free software developer. His winning design, developed entirely with free software, has now been realized and is a legal coin in Holland. Build a neural network that uncovers spam websites.